IP addresses are managed by the Internet Assigned Numbers Authority (IANA) and its regional registries to various organizations worldwide. Making a big splash in the news during 2011 was the fact that IPv4 pool was exhausted. Governments and industries have been planning for the migration to IPv6 to mitigate the limitation of IPv4. Over the coming years, we will see more and more IP address allocations for the IPv6 ranges. At present most people around the world are still dependent on IPv4. Hence in this report, we have collected some data with regards to IPv4 address allocations in 2011 based on the IP2Location. 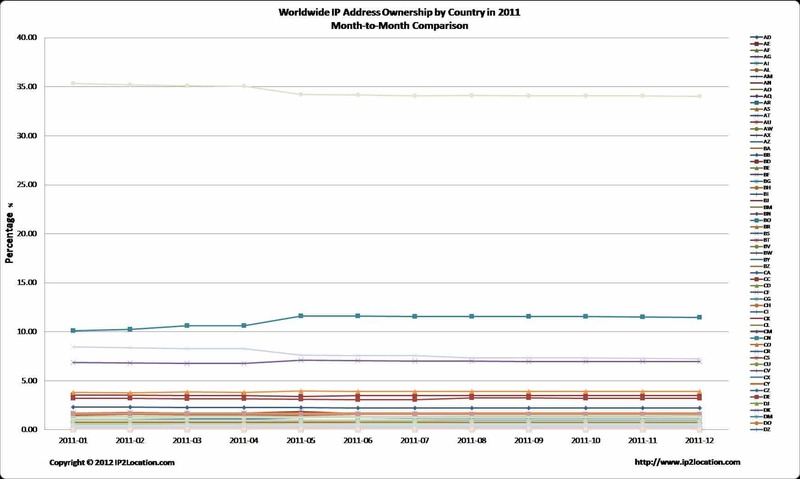 For the past 2 years, the top 4 countries for IP address allocation remains the United States, China, United Kingdom and Japan. South Korea and Germany have swapped places with South Korea now leading Germany at 5th place. The Netherlands has dropped out of the top 10 list after being replaced by Australia. It is also interesting to note that the Nordic countries such as Denmark, Finland, Norway and Sweden have exhibited a reduction relatively in their IP address allocations. Egypt climbed to the 38th position after spending the previous year at 45th position. Tunisia also managed to attain 53rd position after being at 59th position previously. In south-east Asia, Vietnam and Indonesia have also been allocated large amounts of new IP addresses in response to economic growth. 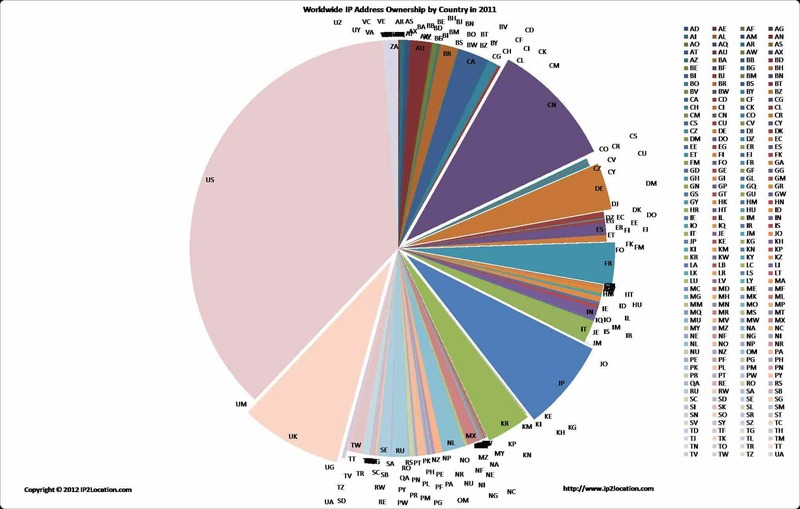 A few countries which have previously not in the list were given new IP address allocations in 2011. These countries include Svalbard and Jan Mayen, South Sudan, Cocos (Keeling) Islands, Western Sahara, Palestine, Christmas Island and Saint Helena Ascension and Tristan da Cunha. From the chart analysis (see Chart 2), we can see that the allocation rate is flat compared to 7.2% in 2010. The total IP addresses allocated for 2011 is 2,881,437,965. Compared to the total for 2010 which is 2,685,024,462, we are seeing a 7.3% increase in the total number of IP address allocations. Considering that the total IP addresses in the IPv4 space is 4,294,967,296, there are only 3,706,452,992 public addresses after deducted 588,514,304 reserved addresses. That leaves us with only approximately 22% of IP addresses to be allocated in Class A, B and C.